I love my dies but sometimes it's fun to do some old fashion coloring with stamps. 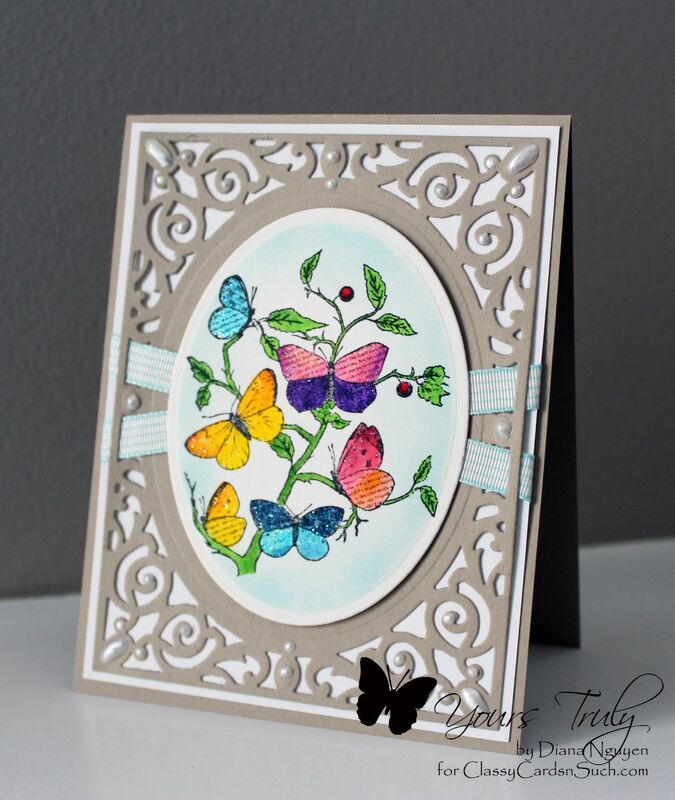 I pulled out one of my favorite ODBD Faith and stamped the butterfly image with Versafine black ink. Since it is an alcohol based ink, I could use my watercolor markers to color and not worry about the black ink smearing. (So stamp using water based ink to color with alcohol markers like Copics and alcohol stamp pads with water based markers. Otherwise you'll get a blended mess.) I die cut the image out using the oval die, kept it in the die and sponged Broken China very very lightly around the edges. I then popped that up with large foam tabs against a kraft die cut background from Spellbinders A2 Filigree Delight entwined with a couple of strands of ribbons. 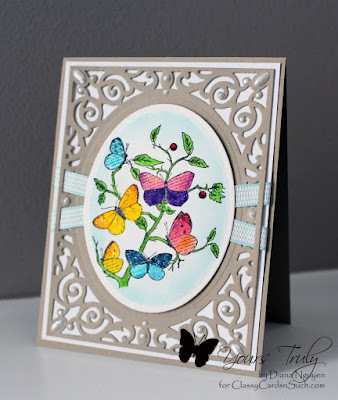 After I adhered all the layers together, I went back and added pearl accents using ice white Viva Decor Pearl Pen and a generous brushing of the Wink of Stella Glitter Pen over the butterflies. The pearl pen was perfect for this card because I could make my pearls more oval shaped to match the die.